Traditional oak framed garages built in Hertfordshire. Based in Hertfordshire we provide an extensive range of oak garages and oak framed buildings built to your specification. We are renowned for our build quality, design and detail. We can deliver a full support programme from the beginning of the process right through to completion, ensuring you receive an oak frame which fits your requirements. 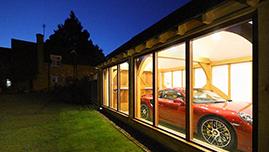 When considering an oak framed garage all you need to do is compare our detail to know you’ve come to the right place. We believe oak is the ideal timber for building a classic garage, since it is such a strong and reliable timber. All of our timbers are quality checked and our frames structurally approved to building regulations standards or above, in fact each Classic frame delivers a very generous array of oak work, designed and built to stand for many years to come. Our craftsmen will carefully erect the frame on site. You’ll be delighted to see that we will be installing a substantial and attractive building reflecting the beauty and strength of oak. We are proud of our accreditation to The Guild of Master Craftsman which we have upheld for many years. You can find out more about how we achieve this standard in our brochure. 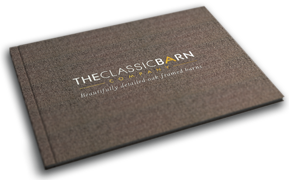 The Classic Barn Company can support clients with planning and building regulation applications with the Hertfordshire planning office or work with your chosen architect to submit planning applications on your behalf. This provides a seamless and enjoyable experience for customers from design through to the finished build. With builds all over rural properties in and around our Hertfordshire office you are likely to have come across our work, we encourage all of our clients to come and visit our creations to hear what others have to say about our Classic frame designs and our working standards. Contact us to receive one of our full colour brochures and for a free no obligation quotation. We are always available to discuss your project and are only too pleased to be of service. 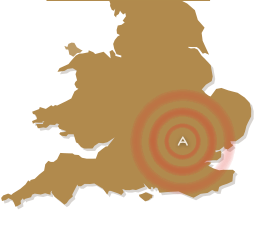 Commissioning projects in Hertford, Tring, St Albans, Hitchin, Watford, Radlett, Hatfield, Harpenden, Bishops Stortford and Hemel Hempstead.